It has been more than a month since the Seoul-based Filipino group “The 601 Habit” started its “The Life Boat Project”, but it has been only days when we had our first turnover of the boats to the beneficiaries. How did it all start? When typhoon Yolanda devastated the Philippines, we thought of raising funds to send to the Philippines. However, when Wendy (the group’s President) saw the article written by Nestor P. Burgos, Jr. on the Inquirer about “Fishermen’s Choice: Job, Not Aid“, she consulted with the group if we could raise funds to buy a boat instead. Everyone agreed and we were excited to help any way we could. When we started our fund raising, we haven’t even voted on the group’s name, but we came up with “The 601 Habit” after all the excitement and happiness we felt for the generosity of those who went to the fund raising. That same night, friend Razel Kim also thought of naming “The Life Boat Project”. We have money to give one boat to a fisherman ~ but we thought we could do more. We opened our GoFundMe “The Life Boat Project” page and another account. That same week, we decided on how we were going to execute the project. Luckily, Wendy Palomo is from Iloilo and she made contacts with people from her province who were also trying to help the victims of typhoon Yolanda. We decided to handle the project ourselves and not be dependent on LGUs, as we know that they too have their hands full with other activities to help the people. Instead of giving to other organization, we are giving to the fishermen directly. As of today, only two have responded to the GoFundMe fundraiser, but many (and most of them Koreans) have not hesitated to trust us with their donations. Private individuals, churches, a Buddhist order and even companies have donated to our cause. Now, instead of just one boat we will be able to give more than a hundred ~ 101 to be exact ~ and we’re hoping to raise more money to build more boats. This project would not be possible without the time and effort of the ladies of “The 601 Habit” who ask for nothing except for the chance to do more for people they don’t even know… and of course, the generosity and trust given to us by the donors. 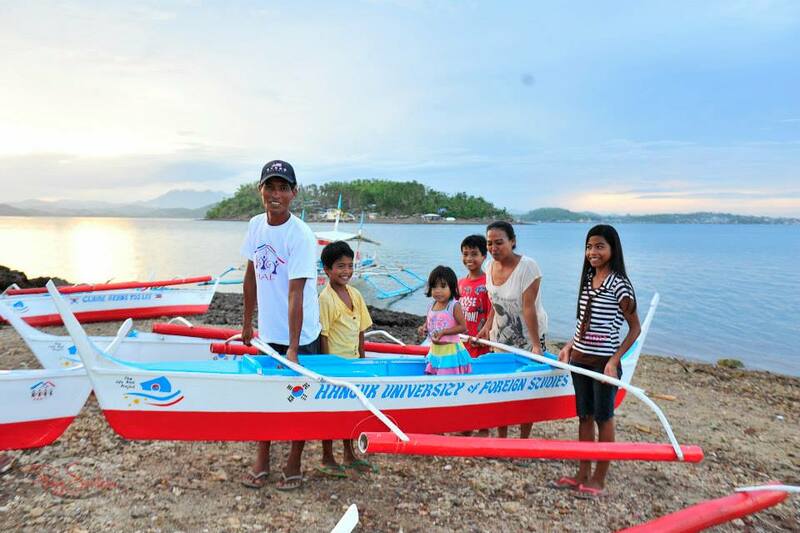 On December 17th, our first turnover of completed boats happened in the province of Iloilo. There will be more turnovers that will happen in Banago, Bacolod City and Antique. Since Wendy Palomo is in the Philippines for her annual Christmas vacation, she was able to attend the said event and made several families happy. We appreciate every amount that you give and for a 200,000 won donation, you could have one boat named. For pictures of the December 17th turnover event, please visit our Facebook page “The 601 Habit”.